Among the ingredients in my traditional mozzarella cheese recipe is mesophilic starter culture cubes. Which I’m sure most folks don’t need and those of us who do, don’t have on hand. DIY Mesophilic starter culture is so easy to make it just seems silly to go buy comparatively expensive cultures! Knowing how to make your own mesophilic starter culture is useful information. It helps you gain a better understanding of the cheese making process. Also, it gives you a greater sense of “self-sufficiency” in the event that you can’t get access to prepared cultures. It’s wise to know how to do something the independent way first. Just to have the knowledge filed away. Once you have learned the new skills set, take advantage of the conveniences available in our modern times. Then you can rest, assured that you’ll know what to do when and if “one day” ever comes. Save in a storage bag in the freezer until ready to use. One cube is the equivalent of one ounce of mesophilic culture. Now, the results with homemade mesophilic starter culture will not be as consistent as a manufactured mesophilic starter culture. But if you’re fine with subtle variations in the flavor of your cheese, then this is a perfect, frugal solution! What cheese will you make next? I was wondering how they made aged cheese prior to stores that sold the culture. Lol. 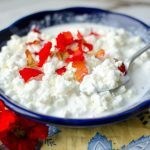 Can you use kefir instead of cultured butter milk? I am confused and I think I just did this wrong. :-] I let my milk sit out and then poured half a cup into Buttermilk from the store. It wasn’t until I look at the comments that I saw I was supposed to make butter 1st. So it this batch a dud? Can you clarify what repeat means. Sorry if I seem dense! Thanks for your help. I have read several recipes on making your own mesophilic starter. Most of them have said to add a store-bought mesophilic starter, and boil the jar and, let sit out on the counter, etc. But you’re saying that it only takes three steps! Is that all? And it works for you? Yep. This works for me. 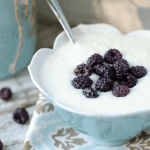 If you start with a flavorful cultured buttermilk, it will work fine and taste great! Ok, so you can make butter 2 ways- with sweet cream or cultured cream. If you do the cultured cream, the buttermilk is already cultured. Go ahead and use it as your mesophilic starter. If you (like us) think cultured butter tastes funky and prefer to make sweet cream butter, then you culture the buttermilk after making butter. Does that make more sense? Im thoroughly confused now…how would one culture the buttermilk AFTER making butter? It’s the same process. Whether you’re simply aging it on the counter or adding a starter culture. 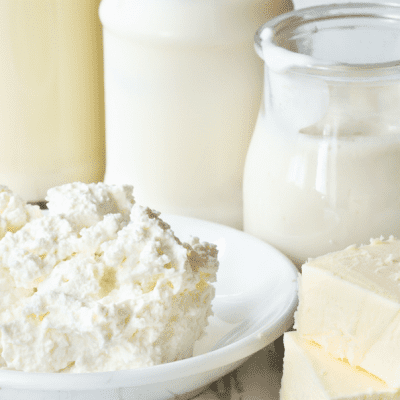 Actually, if you make it before, you’re making cultured milk (which you could then make into butter and get cultured butter and cultured buttermilk.) We don’t like cultured butter here and make sweet cream butter instead. So I culture the buttermilk after butter making. Hope that explanation helped!